A European man heads to Africa for diplomatic purposes. 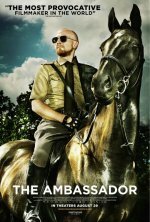 The Ambassador release date was Friday, August 31, 2012. This was a Limited in theaters release. This darkly comic, genre-bending piece of journalism from international provocateur Mads Brugger rips the corroded lid off the global scheme of political corruption and exploitation happening in one of the most dangerous places on the planet: the Central African Republic. 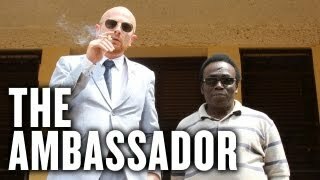 Armed with a phalanx of hidden cameras, black-marked diplomatic credentials and a bleeding-edge wit, Bruegger transforms himself into an outlandish caricature of a European-African Consul. As he immerses himself in the life-threatening underworld of nefarious bureaucrats, Bruegger encounters blood diamond smuggling, bribery, and even murder--while somehow managing to crack amazing razor-sharp barbs at every steps along the way.